How does photojournalism become new when day after day we see the same content? 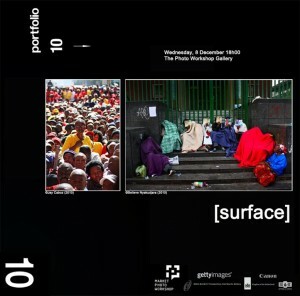 This exhibition aims to look at the construct of surface, or rather, offers the idea of surface as a tool to interrogate the current question facing photojournalism, documentary photography and the media at large. With the glut and gloss of the same imagery – of the typical news image – appearing in media ad nauseaum – the images become purely fillers in and amongst the text. Many of the photographs presented in the media never give the viewer the opportunity to penetrate the surface of the image and indeed many photographers – and by extension the editors and media houses behind them – never do either in this context [with regards to the subject matter]. What purpose then is the photograph or the role of the photographer? The students and the images presented on exhibition offer many strategies and approaches that tackle this question and hopefully offer a more nuanced movement through this seeming crisis. To present the viewer with the gloss of the captured moment, the even-handed sensitivity of a documentary, the photojournalistic diary of event (history) and the recontextualizing of the image into gallery or contemporary art practice. In the images above 2 photographers address the question of agency. As a South African, the woman on the left looks boldly into the camera yet the assumption is that she has tacitly agreed to be photographed while the women on the right make the decision not to be photographed and this speaks to a broader political and safety concern. This photograph was taken at Home Affairs. This is one of the many strategies offered on exhibition that offer an alternative in its nuance in approach.